This is my take on Cuban-style fried pork chunks (masitas de puerco fritas). 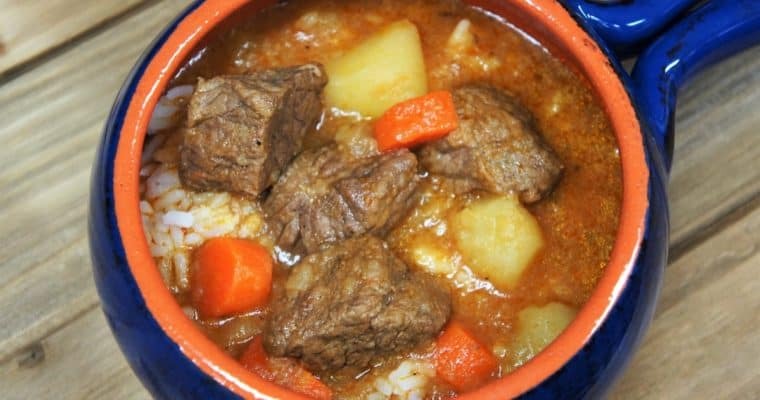 In this recipe, pork stew meat is seasoned with a traditional Cuban spice blend made up of salt, garlic powder, oregano, cumin and black pepper. Then they’re lightly coated in flour and fried until golden brown and delicious. We serve the fried pork chunks as an appetizer with plenty of lime and hot sauce, but they’re also great with white rice and black beans for a filling and satisfying dinner. Enjoy! Add 1 tsp. salt, garlic powder, dried oregano, cumin and black pepper to a small bowl. Stir to combine, set aside. Add the pork to a large bowl. Season the pork with the prepared seasoning mix, set aside. Add the flour to a large baking sheet or pan, season with the remaining salt, stir with a fork to combine. Set aside. Working with one or two pieces of pork at a time, lightly coat it with flour. Shake off excess, and then dip the coated pork piece into the milk bowl, making sure the entire piece is moist. Next, place the pork back in the flour, ensure the pork is completely coated, shake off excess. Set on a pan or plate that has been lined with parchment paper to prevent sticking. Repeat with the rest of the pork. The parchment paper is a must with a flour coating, if you lay the flour coated meat on a plate or pan; it’s very possible the coating will stick. For best results, use the parchment to prevent sticking. Pour enough oil in a large, heavy skillet to cover the entire bottom by about a ½ inch. Heat the oil over medium-high heat. Make sure the oil is hot before adding in the pork. I like to use a test piece to make sure the oil is hot enough. If the oil starts bubbling and makes a sizzle sound, it’s ready to go. Also, be sure the oil is not too hot or the coating will brown too quickly and the pork will not get cooked all the way through. Add enough pieces to the skillet so they fit comfortably without overlapping or touching. Don’t overcrowd the pan; fry the pork chunks in batches. Use tongs to turn the pork so the coating doesn’t flake off. Fry the pork for about 5-6 minutes, turning occasionally to brown on all sides. 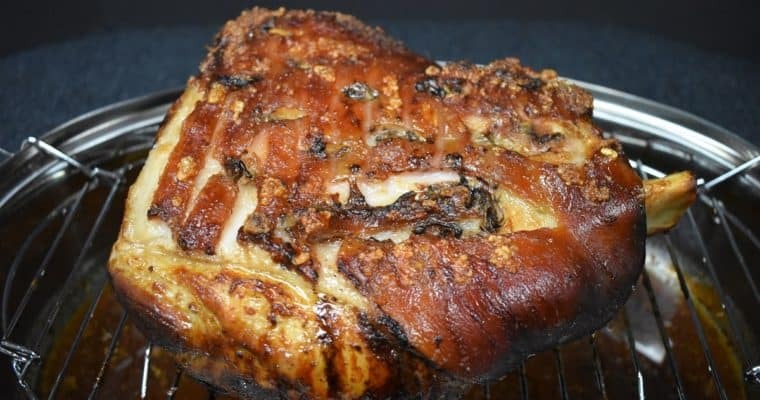 Fry the pork until golden on all side. Make sure the internal temperature is at least 160°F. Season the fried pork with just a small pinch of salt as soon as they come out of the oil, if desired. Repeat with the remaining pork chunks. 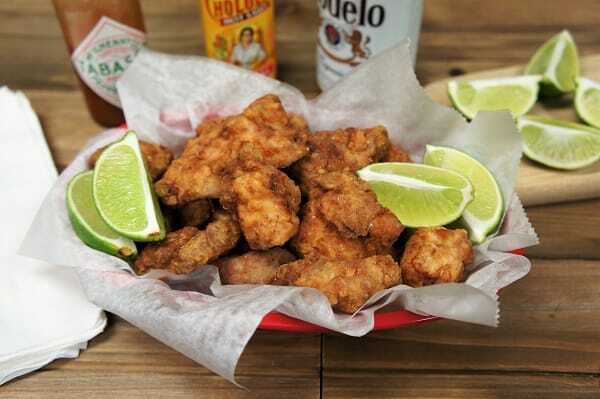 Serve the fried pork chunks as an appetizer with plenty of lime and hot sauce, or with white rice and black beans.